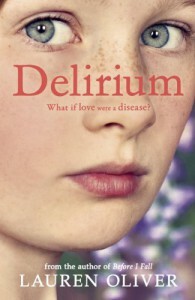 Delirium (Delirium Trilogy) - Because Books! Ok, firstly I'm high on caffeine right now so that could influence this review but seriously.... HAHAHAHAHAHAAHAHAHAHAHAHAHAHAHAHAHA.What. did. I. just. read?So after so many good reviews and so much hype, I was prepared to be blown away by this book or you know at least like it but wow, I want to sue. I want the time and money I spent on this book back.I know I always say "nothing happens" in books but usually something would have happened but in this one? NOTHING AT ALL. Possibly the most boring book I've picked up this year. I got to page 200 and I started skimming hoping for something but then the book ended and I started laughing hysterically because really, this is what I was supposed to love?Maybe I should have known better since the front cover has "Romeo and Juliet" and "Twilight" on it.Lena is what you get when you animate a plank of wood. She has zero personality unless you count being whiny and idiotic. I know we all have low self-esteem but I actually wanted to drown Lena. Shut up with comparing yourself to your best friend, Lena. We get it, she's better than you and yes we agree that she's better than you.Then Alex appears and I guess I'm supposed to feel something for him but he was so boring and one-dimensional and I couldn't care less about him if I tried. He was so generic and everything he did and said was typical and dull.Lena and Alex were predictable and annoying together. This isn't a ship I care to stand by. Which is a good thing because I'm not touching the second book with a 10m pole.Hana was the only promising character and if YA wasn't so unoriginal, she could have been the protagonist. But no, it's YA so because she's obviously pretty, rich, charismatic and other positive descriptions, she can't be. That has to go to the "plain but actually really beautiful girl".There's no plot. Interesting premise, but why should I care about Lena? Why is she relevant? What even was the point of this book? !I get some love quotes because I'm quite the pessimist when it comes to love. Some parts I agreed with and I understood them. But I know this is fiction and Dystopia but this was just unrealistic and weird.I'm not even giving this book any stars at all. Because even the writing was bad. Some descriptions were borderline scary. Careful how you use "literally" Lauren Oliver.